The most major issue since the invention of the television has always been just where to place it. Years ago, TVs were large and cumbersome things that required great thought installing it in a location where everyone in the room could watch it. But at the same time you had to make sure it was also in a spot where you weren’t as likely to stub a toe in the middle of the night. All of that changed with technology, however, and today’s flat screen TV is about as thick and easy to place as a picture. What’s really nice about the TVs today is that they can be placed just about anywhere without really being in in the way. Because they are so sleek and thin, even a 56” large screen can be easily mounted on a wall.The problem becomes all of the stuff that is used along with the TV today. A floating media console takes care of all this, by providing a space for all of the video games, DVDs and blue ray you may be using along with the television (Source). A wall mounted media console doesn’t just provide more floor space. It also eliminates the problem of cluttering the living room with DVDs, CDs, and other related items. 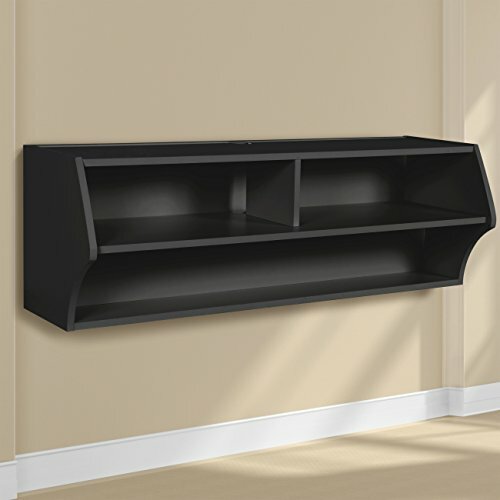 Most entertainment shelves are designed very similarly and all accomplish the same thing, but they do come in different styles and some are simpler to mount than others. Do keep in mind that mounting a wall console of any sort will most likely involve two people. 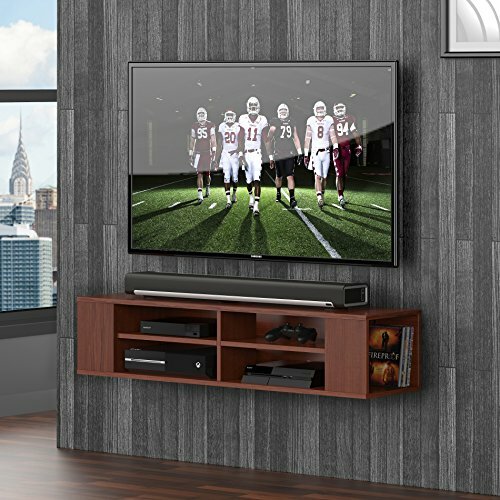 The 66" South Shore City floating media console features six separate storage areas for all of your entertainment devices. It also has two convenient draws for CDs, video games or DVDs. You have trouble finding anything using this well-designed and lightweight unit. The Erfect is a sleek and very contemporary floating entertainment shelf made entirely of environmentally friendly materials. This is a two-shelf unit that can hold up to 100 blue ray discs on the bottom shelf. This is an important feature for the serious moving viewer. The Fitueyes Wall Mounted Audio/Video floating entertainment shelf is a fairly straight forward and simple design with four separate compartments. It’s also designed to make hiding cords and cables extremely easy. This is a very clean looking console that would really work with just about any décor. The 48" South Shore ﻿City Life option is a simple, but a stylish console that provides ample room and storage. It has the added advantage of side openings where items can be placed well out of view. It comes with strong mounting hardware which secures it tight against the wall. The Black Altus Wall Mounted Audio/Video floating media console is another sleek and stylish console with gently curved ends. This is a well-built unit of a design that stands out as not simply a box hanging on the wall. The shelves are 15” deep and can hold up to 118 blue ray discs. This wall mounted multimedia storage unit offered by South Shore is a solid option for those who want a model that goes well with any type of home decor. Users love the looks of this media shelf, but some do complain about receiving a damaged item. This product is a modern-looking designer wall-mount media console. It features 6 open storage spaces, 2 lateral open spaces for CDs, DVDs and video games and a hole for easy wire management. This item seems like a solid choice if you want a piece of furniture that is specially designed to meet today’s electronic equipment needs. The general user consensus concerning the South Shore wall mounted media console is that it has a very nice look for compressed wood. They add that the assembly is very easy. However, several buyers complain about receiving a damaged item. One dissatisfied buyer complains about poor execution of the otherwise beautiful piece of furniture. If you are looking for a top-rated wall mounted media console, you might want to consider this floating media console offered by Erfect. Users like the design of this space-saver, but some do complain about its cheap quality and too short anchor screws. This product offers ample space for your media devices and allows you to keep your space looking neat. It features two large compartments for placing your media devices (such as movie players and video game systems) in, as well as an extra-large bottom shelf for storing DVDs and CDs. The item is available in three colors: black, brown and white. 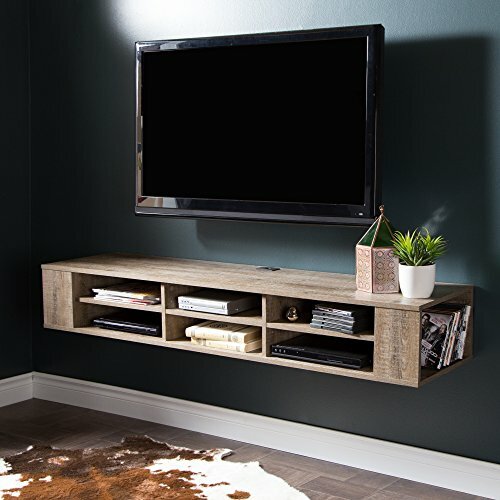 This wall mounted media console storage might be a good choice if you are looking for a highly contemporary set-up to go under your wall-screen TV. In general, users have a favorable opinion of the Erfect shelving unit.What they praise is that it is well suited for rooms with tight spaces and that it is easy to assemble thanks to simple directions. All in all, buyers agree that it is a great value for the price. However, many buyers express complaints regarding the quality of this wall mounted multimedia storage. As one online reviewer states, it is made of cheap plywood which can be damaged even by fingernails. Another frequent complaint is that the anchor screws are too short. This contemporary wall mounted tv cabinet offered by Fitueyes is a solid option if you want a model with a modern, space-saving design. Users like the attractiveness and functionality of this product, but do complain about the hard assembly and missing parts. This product offers two generous storage compartments for a cable box, DVR or other media components. Thanks to the cutouts adjacent to wall, cables and wires are neatly concealed to give the console a professional, minimalist look. It features a strong and tested metal hanging system for fixing it on a wall.This product might be a good choice if you want to give your room a dash of modern style. In general, users have a favorable opinion of the Fitueyes floating TV stand and they agree that it is attractive, functional and perfect for tight walls.Many of them state that it is sturdy and that it has a high-quality appearance. However, some purchasers complain about the hard assembly and mounting. A frequent complaint regards the missing screws. This wall mounted media console offered by South Shore is a solid option for those who want to give their living room space and a superb airy look. Users like its design, but do complain about safety issues. This product features many storage spaces perfect for electronic devices, as well as a hole for easy and convenient wire management. It also includes a metal hanging system for mounting TV to stand firmly on a wall. This piece of furniture can hold up to 75 lbs. of weight. It comes in three colors: black oak, chocolate and grey maple. This item could be a solid choice if you’re looking for a contemporary floating media shelf. In general, buyers have a positive opinion of the South Shore media console. They state that it is a great floating entertainment shelf for the price. They agree that it has a nice and clean look, as well as that it is sturdy. However, many buyers complain about it being cheap and unsafe, stating that the anchors behind the console that hook onto the metal bracket screwed into the wall are too weak. Several purchasers experienced their unit falling due to the above mentioned issue. If you are looking for a wall mounted audio/video console, you might want to consider this one offered by Prepac. 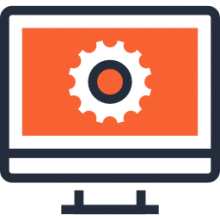 Users like its design, but some have complaints about its fragility and receiving a damaged item. This product features two generous storage compartments. The main shelf being 15-inch deep provides ample space for a cable box, DVR or other media components. The bottom shelf has room for over 100 Blu-Ray discs or for whatever else you want to store high above your freed-up floor space. You can choose between two colors: black and espresso. If you are looking for a sleek yet functional console,this might be a good option. In general, users are happy with the Prepac wall mounted video/audio console. What they like in particular is that it is sturdy and easy to put together. They agree that it is a perfect complement to a wall-mounted TV. However, some purchasers complain about receiving a damaged item. Others complain about the wood being too fragile due to which the product broke during the assembly. Simplyorganized.me provides some useful information concerning how to best employ your media console to tidy up your room. The author is the mother of several children. She describes how messy the living room becomes, cluttered with all manner of toys and electronic paraphernalia. She tends to do a dramatic cleaning of the living room every season, which helps it stay under control. The family decided to invest in one of these organizational consoles to provide greater storage space in their home. Their particular console is attached to the wall, has cubbies, cupboards and various nooks that they've filled with wicker-pull baskets. Each of the baskets is categorized so that they can usually access their tea set, their son's toy animals, sports equipment, action figures and play cars. For added effect, she used chalkboard labels. These DIY labels add a fun touch to the home's decor. On the bottom, this organizational media center has a pullout drawer complete with dividers which help to organize DVDs, PlayStation 4 game controllers, and other gaming equipment. Further, they use small plastic tubs to fit inside the cupboards for toys with a lot of small pieces like Jenga blocks and green plastic toy soldiers. Another cupboard holds art supplies- this particular cupboard has a slide-out drawer which is also subdivided to hold crayons, colored pencils, and drawing books. One thing this organizational pro mentioned, make sure that the console you choose doesn't mark up too easily, though if it does you'll want to be able to clean it up with a wet sponge and some Tilex. 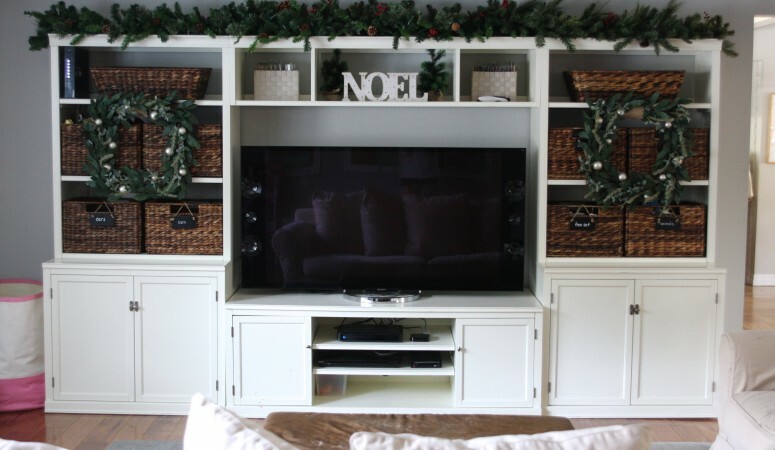 Since the author is a professional consultant that helps tidy up and develop systems of organization and homes, she's well-equipped to advise that when you purchase a wall-mounted media console, you want one that is functional but it is also attractive. If you're so motivated, during the holidays it's easy to dress up your media console, particularly if it's large, with Christmas wreaths or during Halloween with orange and black streamers.